This is an original article from the MFG Day blog. The 7th annual celebration of modern manufacturing is upon us - October 5, 2018! Over 100 event hosts have already registered in Illinois, and are finalizing presentations and preparing to host attendees. All of this activity is taking place behind the scenes, as we get ready for the Manufacturing Day events that will commence on October 5th, 2018, continuing throughout the month of October. What can you do to increase Manufacturing Day awareness? Leading up to Manufacturing Day 2018, and throughout your hosted events, use social media to tell your story. By connecting with MFG Day, and with our list of sponsors, endorsers, and co-producers, you can take part in the global conversation about manufacturing today. In turn, the information we all share can help educate others about what manufacturing is -and what it isn't. Whether you are hosting a public event or celebrating in some other way, you can help to open doors and minds through your social media presence. Companies that host public events are encouraged to create a Facebook event to update potential attendees on schedules, locations and any changes before the big day. Endorsers or companies hosting private events can still support the movement by liking our pages on Facebook, Twitter, Google+ and LinkedIn. Watch our email newsletters and social posts for information that you can share with your followers, to spread the word and start more conversations about manufacturing! 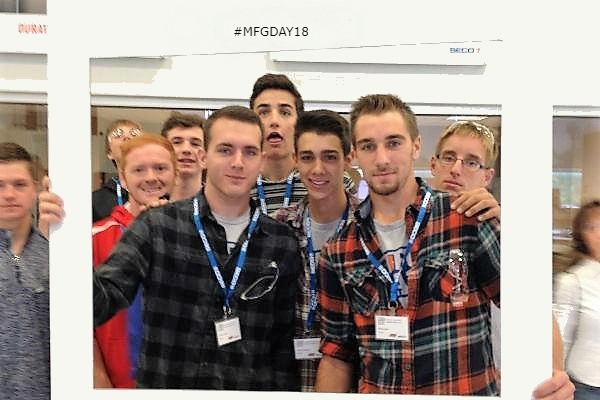 Of course, it's always advisable to use our official hashtag - #MFGday18. Modern manufacturers are adapting their marketing strategies to include social media, just as equipment and processes have evolved to increase productivity in the last few years. Businesses, local governments, and even publications are using social media to be seen by more people, and to take part in conversations about what matters to them. We want to be a part of those conversations. Our resources page is full of tools that can help get you started. Also check out our Social Media Playbook, to find more ways you can connect with your community, your elected officials, and the world. Are you hosting an event? Be sure to tag us on social media @IMECIllinois.